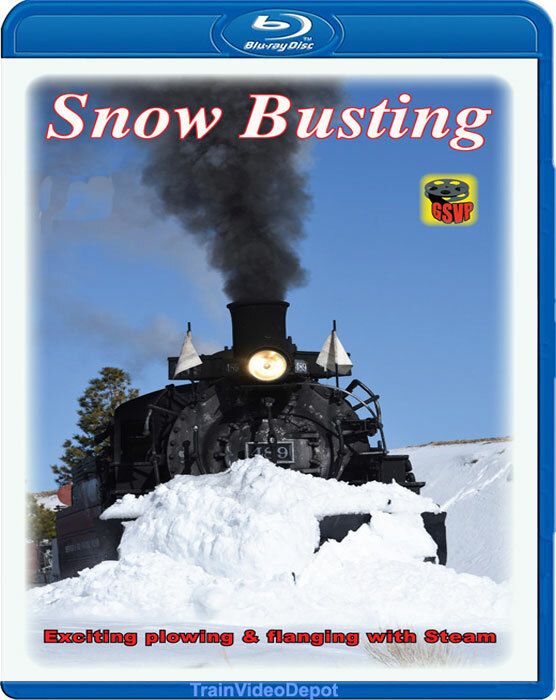 Special photo charters were arranged for March of 2014 that would use a steam locomotive (K-36 #489) and flanger OJ plus other cars to show winter operations and snow clearing like in the old days of the Denver & Rio Grande Western. All equipment is letter for Rio Grande to make this feel like a 1940's or 1950's winter operation. Besides dramatic snow busting with the pilot plow mounted on the engine we see the flanger move snow further from the tracks, as it is coupled behind the tender. There is normally little snow at the bottom, so special freight train and flanger runbys were made before reaching the higher elevations where snow would be cleared. These days in 2014 were so successful, that more days were planned for 2015, and 2016. Each year is a little different, with differing snow and weather conditions. On one trip the 489 gets stuck on the wye at Big Horn which was interesting to see that unfold. On a different year (2015) there were some big cuts full of snow requiring several runs trying to bust through. If you own some of our other snow plow videos such as Winged Wedge Plows, or Rotary Snow Plow videos, then you will find this one a bit different but just as interesting. The trips were designed for good morning and afternoon lighting, so there are some nice sunrise scenes early in the morning, and at some classic spots like Lava, Big Horn, and Sublette. Three years of action is condensed into this one video. Available in Standard Definiation, and HD Blu-Ray. Please be sure you have a Blu-Ray player before ordering BR. BR players also play regular SD dvd's. Watch a brief Preview of the video. Color, live audio, and limited narration so you can enjoy the action. Rail Buff (Southern Californa) on 2016-11-06 13:39:32. This video was shot over three days during a photo excursion, and there were many, many photographers present. Lots of snow plowing. At one point the locomotive was snowed in and couldn't move forward nor backward and had to be towed out by a backhoe. This same episode was also videographed by James Palfrey (Steamtrain Videos) under the title "Winter on the Narrow Gauge", also in Blue Ray. Interesting coincidence. I wonder if Steve and Greg personally know each other and if not, if either knew the other was there. Interesting coincidence. I don't think both Greg and Steve know each other. But what I do know is that Greg Knows Les Jarrett for producing various Special videos in the 1990's & 2000's. Steamboy (Revere MA US) on 2016-12-26 15:40:00. Ok. in this new GSVP program for the end of the 2016 season, it contains March 15 & 16 2014, March 5, 6, & 7 2015, and March of 2016. All of these trips were Shot by Ronald Burkhard due to Greg himself Recovering from middle aged illness. One of the most interesting things on this one besides the Pilot plows on 489 & 487, is when 487 got stranded in the middle of the east leg of the wye for 2 hours, and would have to be rescued by a front loader. Overall, I would say that this is an OK GSVP program, and a unique companion to the September 2014 C&TS titles.